With your naked eye or any good high-resolution camera, you can tell a lot about different objects, such as their color, texture, and rigidity. But you cannot determine what the actual material is made of without a Near Infrared (NIR) Sensor. NIR is the only technology that can determine the difference between two materials by analyzing their composition. 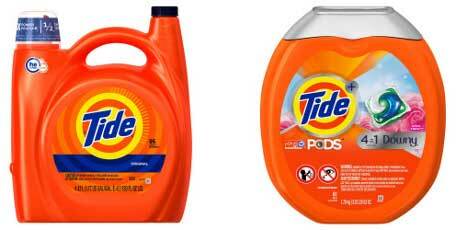 Tide detergent comes in various packaged forms – small bottles, large bottles, and buckets of detergent pods. Each package is identical in color, and similar in branding. They look to be of identical material to the naked eye or any 20-megapixel camera. However, the Tide bottle pictured above is made of HDPE, and the bucket of pods next to it is made of PET. It takes an NIR sensor to be able to determine what each bottle is made of and help make a sorting. Other optical sorters using an off-the-shelf NIR sensor may have enough NIR resolution to successfully sort objects by material type (like these two Tide bottles). However, to achieve this recognition they have to place their NIR sensor close to the conveyor (12-18 inches above). An NIR sensor only 12-18 inches above the conveyor works great for 30 minutes during a demonstration or in a laboratory. 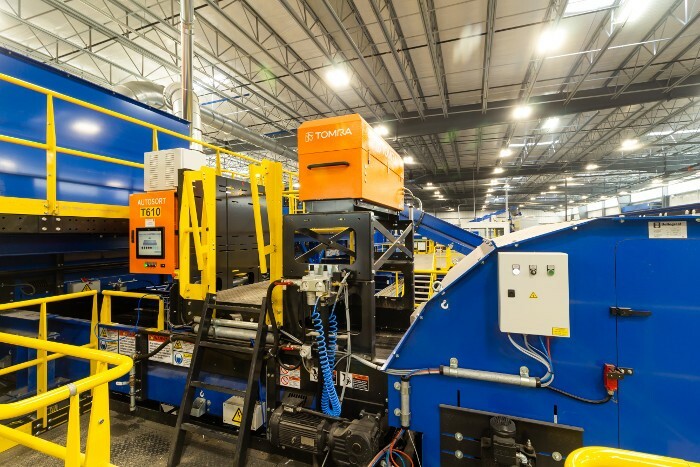 But in the real-world dusty, dirty environment of an MRF, a sensor’s lens that close to the belt is prone to collecting dirt in less than an hour. As a lens gets dirty, it stops being effective. A 95% recovery rate at the beginning of the shift drops significantly in just 30 minutes of dust/dirt build up. It drops dramatically after 2 hours, and could be cut in half by the end of the shift depending on how dirty or dusty the material is on a particular day. Purity rates drop similarly. TOMRA stands head and shoulders above the rest—literally. 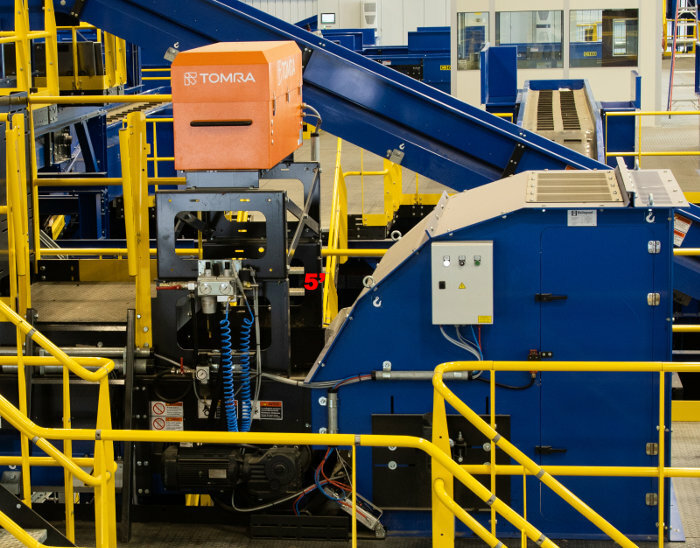 TOMRA has the industry’s highest NIR resolution BY FAR and they have leveraged this superior resolution to solve one of a MRF’s biggest problems – consistent performance in a dirty application. With the highest NIR (near infrared) resolution available, TOMRA’s scanner box is now able to be set a full five feet above the conveyors (up to 5x the distance of others) and still achieve purity rates above 95%. The height allows the lens on the scanner to stay out of the way of dust and debris traveling across the belt, keeping the lens clean for an entire week or more and the separation quality at its best. Why can’t the competition set their scanner high above the belt? Simple – they don’t have the resolution. That’s a 16% increase in HDPE recovery and a whopping 60% increase in PET! Steady performance over long periods of time yields the best results. TOMRA’s superior NIR resolution allows them to take this technology and incorporate it into a flake sorter. Most flakes sorters use metal sensors or color cameras. TOMRA’s is the only flake sorter that successfully combines simultaneous detection of color, enhanced material information, and metal using high resolution NIR. Consider this: if another optical sorter company claims to have high resolution NIR sensors, why don’t they make a flake sorter? How does TOMRA achieve this high resolution? The patented Flying Beam. All TOMRA machines employ the advanced technology of FLYING BEAM illumination. A rotating polygon mirror reflects an evenly distributed source of light across the entire belt and offers continuous signal correction for stable sorting performance over long periods of time.